So far, we have studied only the system of dendritic growth including the isotropic surface tension. The anisotropy of surface tension may play an important role in free dendritic growth. 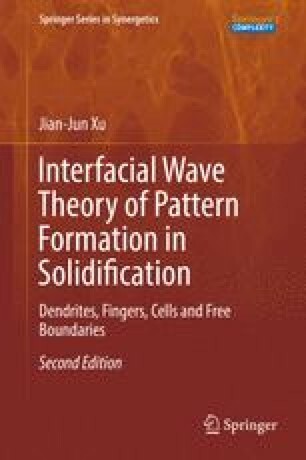 To explore the effect of anisotropy, for the sake of simplicity, we study two-dimensional free dendritic growth from undercooled pure melt, which can be considered a simplified mathematical model for demonstration of the dendritic pattern formation observed in a thin Hele–Shaw cell. The typical experimental record is shown in Fig. 7.1. We are concerned with the behavior of the system at the late stage of growth and retain all the assumptions, scales, and notation that were introduced in the previous chapters for the 3D case, such as that the undercooling away from the growing dendrite-tip is uniform and that there is no convection or external forces involved in the system.